This large and fully tiled pool is usually available between May and September (dependent on weather conditions) – it is extremely popular in the summer months and there are no extra charges for onsite visitors. It is 12m long x 6m wide (39' x 20') with two depths - 1m at the shallow end and 2.4m at the deep end. The pool water is solar heated using an array of 180 solar pipes. The Play Area is spacious enough for children to run off their excess energy. It is a great area for children to get together and meet new friends. 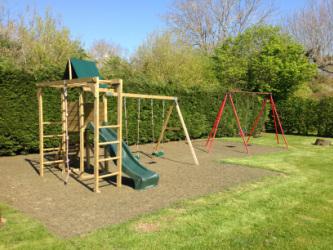 At one end there is a new climbing frame and swings with a protective rubber surface. The remaining space is available for ball games.